Danze Plymouth Collection Chrome Robe or Towel Hook: This Danze Plymouth Collection Towel or Robe Hook is built to last. The highest quality standards are used to precision manufacturer a top of the line fixture. Important features of this 100% BRAND NEW Fixture: Complete Item! Everything necessary for installation is included. 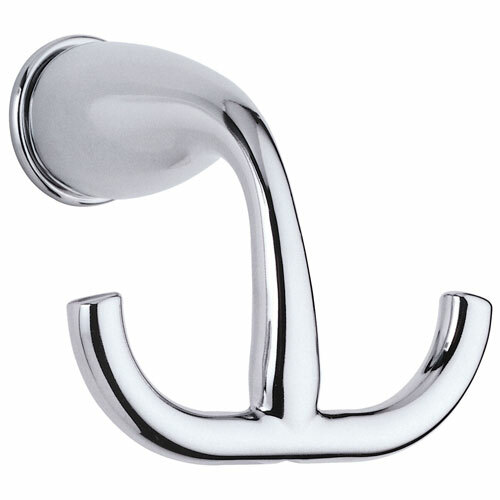 Chrome Bathroom Accessory Towel or Robe Hook - Robe Hook Plymouth - This robe hook from our Plymouth collection will provide a convenient place to hold your robe while adding a decorative look to your bathroom. Installation is easy and won't take long at all. - Can easily be installed at desired height along wall - Concealed mounting offers a seamless appearance - Chrome premier finish designed to resist fading and tarnishing. - Designed to match a variety of different faucet styles - All metal construction provides sturdy support - Matching Accessories Available - Easy to Install - Installation instructions included. This fixture is manufactured by Danze and is part of their Plymouth Collection. This robe hook from our Plymouth collection will provide a convenient place to hold your robe while adding a decorative look to your bathroom. Installation is easy and won't take long at all.